We need to go to the big city, San Jose to take care of a big concern. We first thought about taking the bike but then decided that a bus will be less hassle. We are at the bus stop by 7:00 AM. 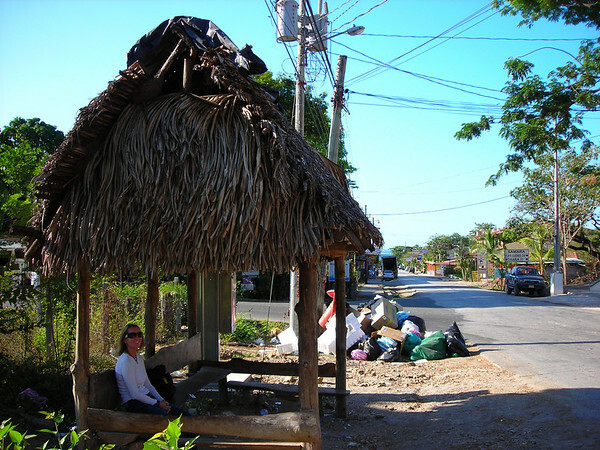 The plan is to just 'wing it' and catch a bus to Nicoya. 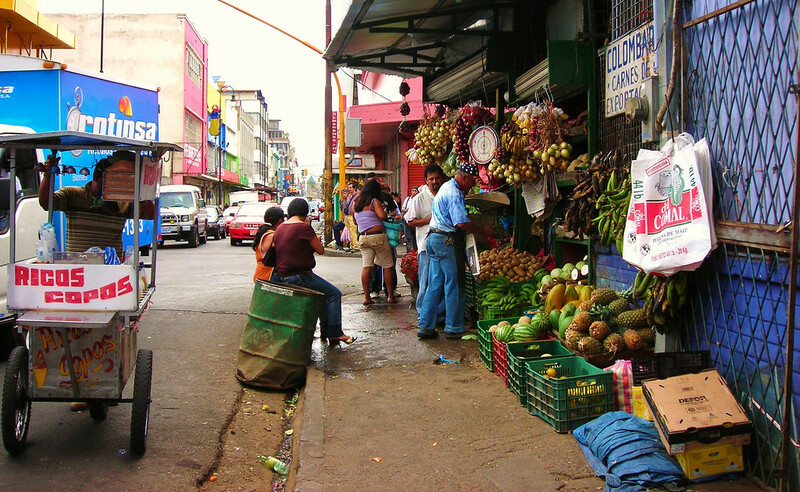 At Nicoya we will hopefully catch a bus to San Jose. It's a long ride so we plan on spending the night in San Jose if necessary. We wait for an hour. Over a dozen people show up and wait with us. 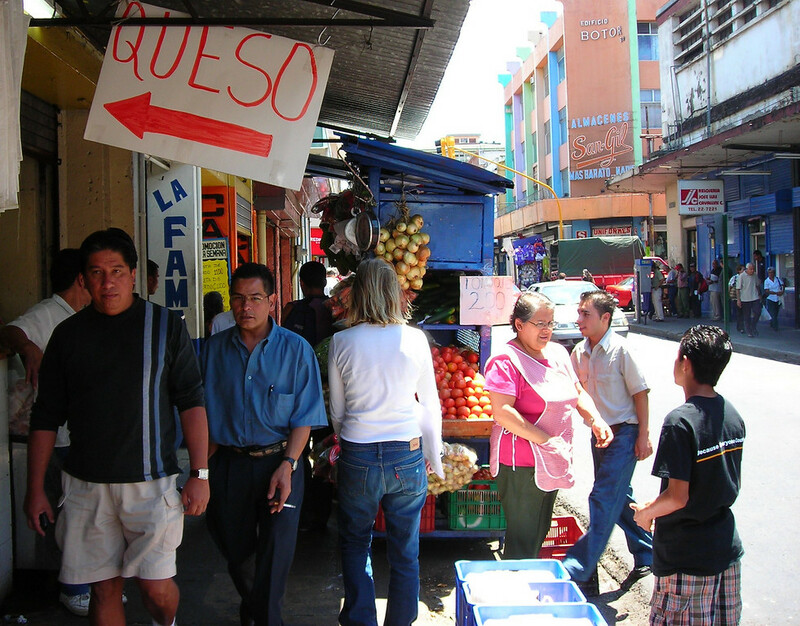 The local etiquette seems to be, when you walk up to the bus stop you start out with a greeting to whomever is already there "buenos dias" Everyone replies "Buenos dias" It's nice. We all jump on the bus for Nicoya. We don't know what the deal is with this garbage pile at the bus stop. It never gets any bigger and never goes away. And it usually smells. Why does it have to be at the bus stop? 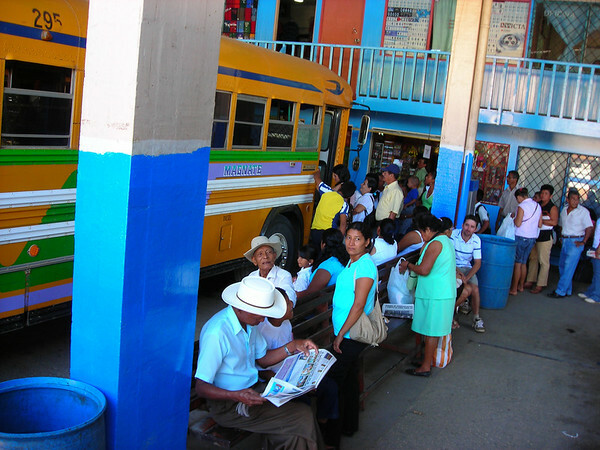 At the Nicoya bus station we find that a bus is leaving for San Jose in 90 minutes, OK. There are a lot of food options at this bus station. We see our favorite, empanadas. The pollo (chicken) empanadas here are some of the best. The shell tastes like cornbread. 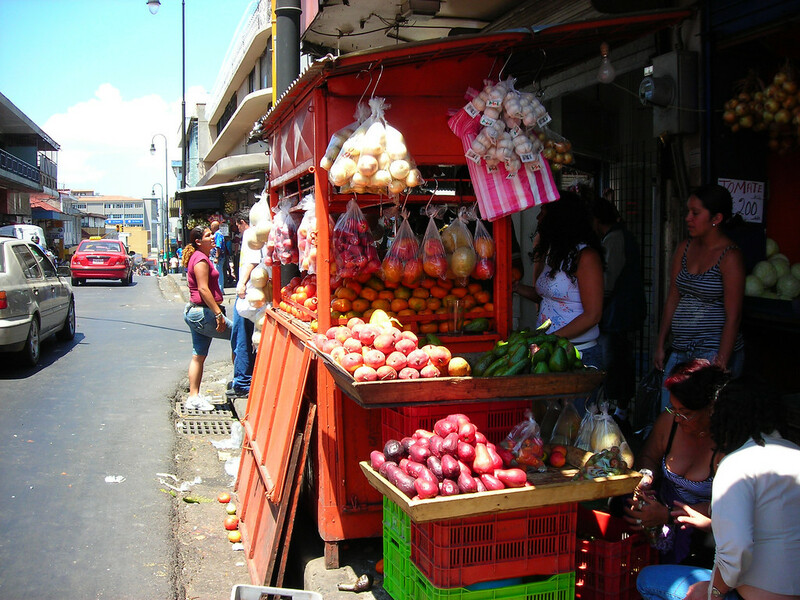 We often find the best and for sure most affordable food at bus stations. 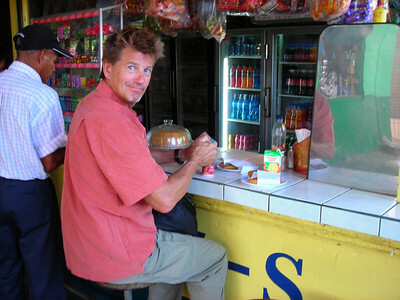 We still talk about the great empanadas at a bus station in the Dominican Republic. That was over ten years ago. Anyway, we get 4 large empanadas, OJ, yogurt and a bottle of water, ~$4.50. This little diner will always be on our radar. Seven hours after we started we are in San Jose. We do some walking with a map, jump on a public bus then take a taxi a short distance to the place we wanted. Great, we have an appointment and need to come back in three days, mission accomplished. We jump on a bus back downtown. Downtown we travel on foot and find the bus terminal we arrived at. A bus back to Samara is leaving in three hours, perfect. 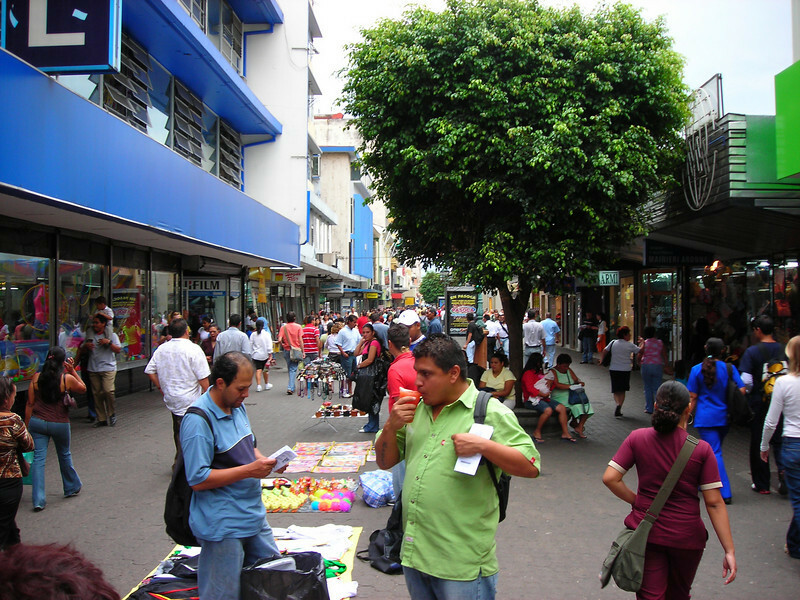 The San Jose bus terminal area is a little seedy but this is nothing new to us, we have experienced much worse. We circle around until we find a 'mom and pop' bar restaurant. It's a nice place for food and a few cocktails. The cost for everything was less then what we would pay for the drinks alone back at the beach. We like San Jose but are not looking forward to the 7 hour bus ride back, then we have to do it all over again in three days. 'Two days later' we are back on the bus bound for San Jose. Our appointment is early in the morning so we decide to go a day early and spend the night in style and stay right at the city center plaza. We looked at a couple hotels recommended in the Lonely Planet shoestring guide book but we are looking for something a little more then 'shoestring'. The Plaza Hotel, $48 with a full breakfast included. And this is right at the center of all the action. Checking out the scene here is cool, the plaza is for pedestrian traffic only and is there the traffic. People are going back and forth all day and all evening. 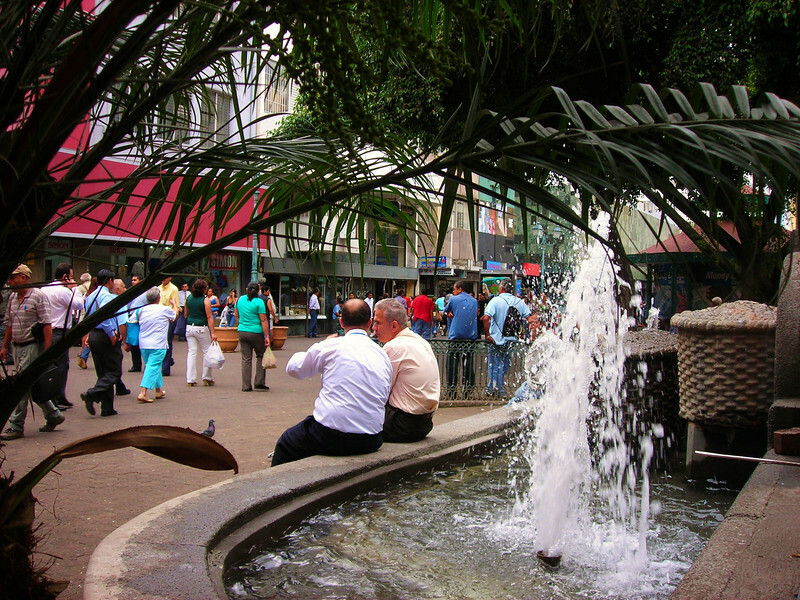 The streets are lined with fountains, shops, restaurants, bars and places to hang out with open air seating right on the street. This feels like this could be a downtown in any big city. 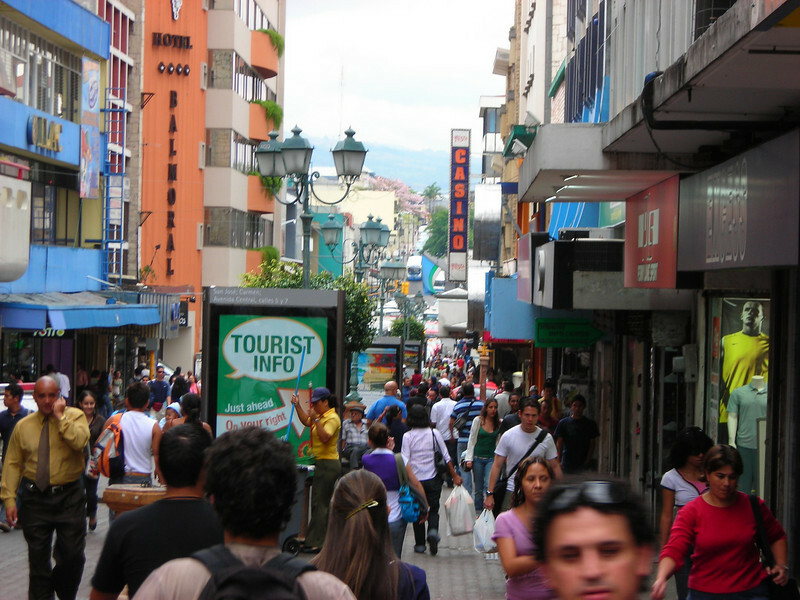 This is a nice diversion, we enjoy the 'heart of the city' scene with all the people and places to see. We've heard many bad reports about San Jose from people we have met recently. Our ride plan was to avoid riding through the city. Well, we like San Jose and are very glad we didn't miss it. The next morning we walk out to the street hoping to catch a bus out to the suburbs. Unbelievably we see a bus with sign of the suburb we want and jump on. Fifteen minutes later and a short taxi ride and we are there. Smooth, we have this city 'down'. Knowing that our lives may suddenly be turned upside down 'or not' in just a few hours is a surreal sensation to say the least. This whole journey to San Jose doesn't seem real. It's like a bad dream. We await the results. Thank god, everything is good! We feel like we dodged a bullet. Like our lives have suddenly been given back to us, at no cost. We feel in shock. OK, it's before noon; we know the last bus to Samara departs at 6:30 PM. So….I guess….It's time to CELEBRATE. 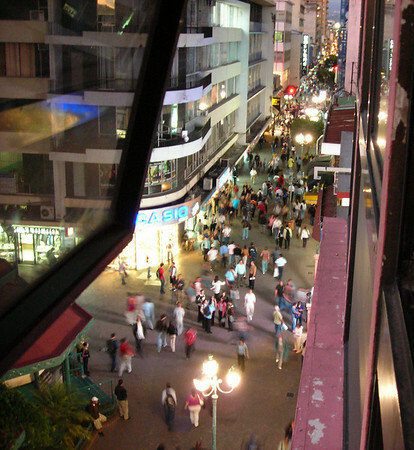 We take a bus back downtown and wander around until we find a place that looks interesting. 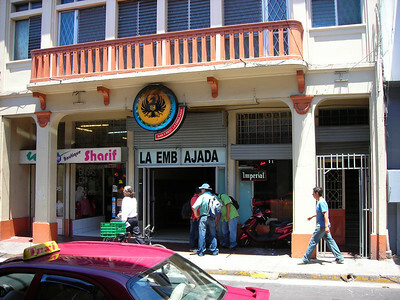 La Embajada, this place is huge and is full of people. The custom here is to buy a bottle of your spirit of choice and your wait person supplies you with ice and mix. Yeah! We talk about feeling reborn and the fact that nothing has to change now. To us this is a confirmation that what we are doing is what we should be doing. i.e. Living life.